At Minaret Station, conservation and tourism go hand in hand. Our passion for New Zealand's great outdoors, as well as our joy in sharing this with guests, runs deep in our veins. As a Department of Conservation concessionaire, we are privileged to have access to some of New Zealand's most picturesque and remote locations, including Mt Aspiring National Park and Fiordland National Park. The Alpine Lodge is set in a stunning glacial valley. The lodge operates predominantly using hydro electricity generated from a waterfall near the main lodge. All water to the Alpine Lodge originates from the station’s healthy annual rainfall and snowmelt. The drinking water available in the chalet’s is drawn directly from the snow and rain-fed waterfall behind the Alpine Lodge and is 100% pristine, New Zealand water. On Minaret Station we carry out an extensive trapping program to stop predators such as stoats, from taking the eggs of nesting native birds. Every effort is made to protect the beauty and delicate balance of the station’s wild surroundings. All waste is removed from the property and recycled as much as possible. Supplies are transported onto the property via helicopter, and laundry is done off site, ensuring a very low footprint at the location itself. Food is central to the Minaret Station experience. Our chefs use the freshest local ingredients, including lamb, beef and venison from our own 50,000 acre working farm. Minaret Station sources all of it’s produce from the Wanaka region, working closely with local growers and farmers we know and trust. As part of a pledge to make a positive difference, Minaret Station has signed the Tourism Sustainability Commitment. Managed by the Tourism Industry Aotearoa this commitment aims to ensure economic, environmental and social sustainability throughout the tourism industry of New Zealand. 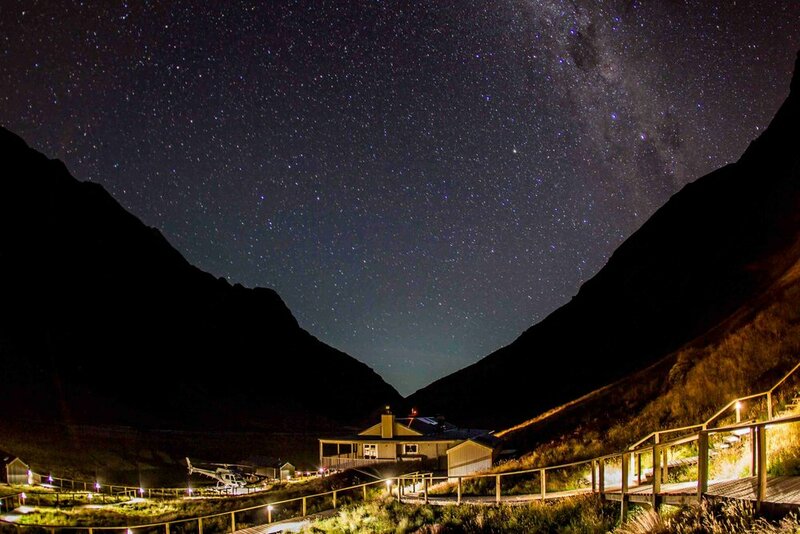 A total lack of light pollution make star gazing at Minaret Station one of the property’s most breath taking attractions. Notable Southern Hemisphere constellations include the mesmerising Milky Way, which can be seen throughout the year as a wide, intense band of stars-across the night sky, and the Southern Cross constellation, made up of the five ‘pointer’ stars. Minaret Station lies right on the cusp of this reserve, affording spectacular views.